There are several physical diagnostic tools that are commonly practiced in Ayurveda and one of the main ones includes nail assessment (called Nakha Pariksha). Just as the tongue, hair, skin, and other external attributes are very telling of one’s internal health, the nails can be a strong indicator of possible issues occurring in the body as well. According to Ayurvedic medicine, the nails are a by-product of the bones (asthi dhatu) and, therefore, the health of the bones can be reflected in the health of your nails. In this sense, thin, brittle nails may correlate to thin, brittle bones. In Ayurveda, everything we do and every trait we carry is a piece of the doshic puzzle of your natural born constitution (known as Prakriti). Therefore, even our nails can give us some indication which dosha is predominant in our constitution and, also, which dosha is currently out of balance. 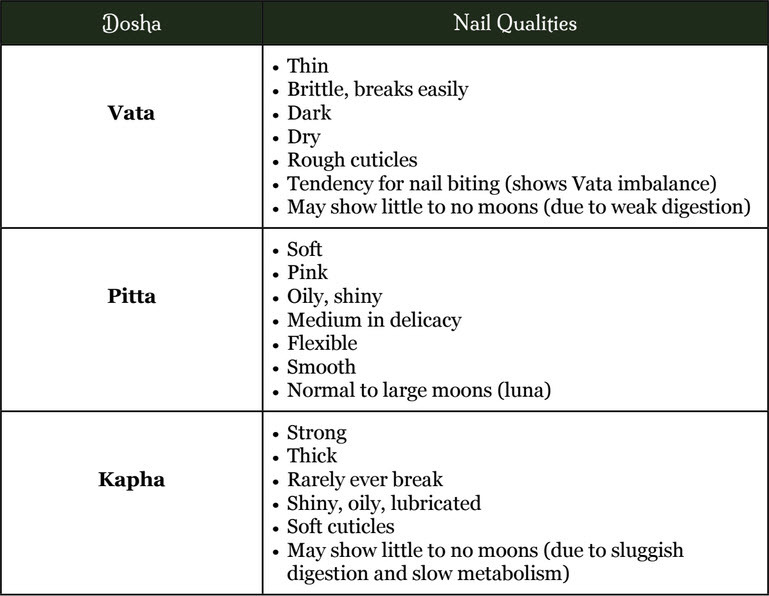 Here is a brief chart that gives the typical findings of the nail as it relates to the different doshas. These long lines are all too common for many individuals and typically indicate a clear sign of malabsorption of nutrients in the body. 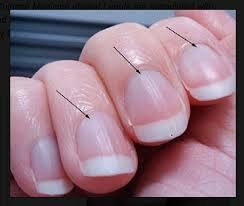 They typically cover the entire nail, from the bottom to the top. Very mild lines that are hard to see without the proper light show a very mild case. The deeper the lines, however, the stronger the deficiency and, therefore, the more important it will be to discover the cause and remove it. Malabsorption can be related to poor digestion, excessive toxins in the system, inflammation in the GI tract, a Vata digestive disorder (Vishama Agni), a Kapha digestive disorder (Manda Agni), a Pitta digestive disorder (Tikshna Agni), or a poor diet in general. Since this is only one piece of the puzzle, other analysis must be further completed in order to establish the actual cause. Read more on the causes, symptoms, and treatment of Malabsorption here. According to Ayurveda, a deep line that runs horizontal to the nail is an indication of a strong illness, infection, or depletion that occurred during the time that specific part of the nail was growing. It also can mean an issue of the metabolism, showing vitiated digestion at the time of growth. If there are multiple horizontal lines on the nail, this indicates a reoccurring issue and most likely is showing a chronic condition (whether metabolic, infection, depletion, etc.) In some cases, these multiple lines can relate to the involvement of an under-active thyroid. 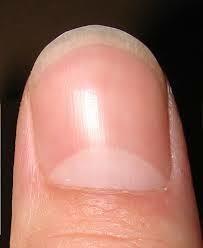 In Ayurveda, the lunula of the nail represents one’s Agni or fire in the body. If you look at your nails and notice there are no moons (lunula) or extremely small moons, this is a sign that there is weak digestion or fire in the system. Weak digestion is an indication of poor metabolism and a potential build-up of toxins in the system. It also is a common root cause for most disease and disorder and should be treated immediately. Click here for the top 10 Food Rules for increasing the digestive fire! If you have nice, large moons on your thumb to the pinky finger, this represents a strong healthy fire in the system. Ideally, one should have a large moon on the thumb, as they remain strong, but get a bit smaller with each respective finger. However, if they seem larger than “normal” this may show an overactive fire in the body which can lead to Pitta issues such as loose stools, hyperacidity, inflammation, and malabsorption of nutrients. This simply means there is too much fire in the system and cooling practices and diet should be administered. ***Please note that if the whole finger is white, except for a small crescent at the top, this is a different issue typically caused by liver disease. 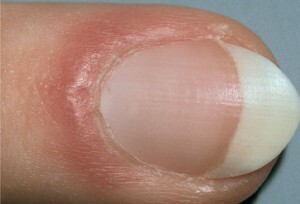 If you notice a red, puffy border along the nail fold, this is typically a sign of parasites or infection in the system. Parasites are prevalent in many individuals and have multiple causes. A few common causes are traveling or living in a developing country, drinking from rivers or lakes, not washing hands properly after elimination, or through a transfer from our furry little friends. 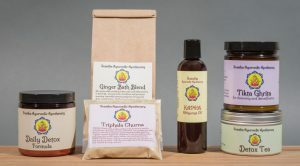 Parasites are efficiently treated in Ayurveda through proper diet and herbs. ***A less common cause of the red nail fold can be through Lupus or another connective tissue disorder. 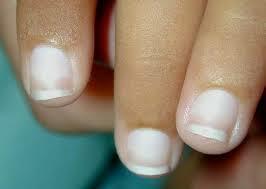 White spots on the nails are very common among a large number of individuals. Of course, if this is just a one-time occurrence, it may just be due to a trauma to that part of the nail. 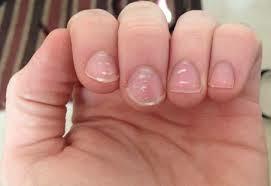 Often, however, this is seen on more than one nail and is a recurring issue. If you are experiencing the latter, this simply means that there is a calcium, zinc, and/or magnesium deficiency in the body. This may be due to a poor diet or could be the result of malabsorption. Malabsorption is a lack of ability for your body to absorb specific nutrients and has a wide range of causes. Some of these include poor digestion, inflammation in the GI tract, excessive toxins in the colon, intake of allergenic foods, chronic loose stools, or parasitical infection. 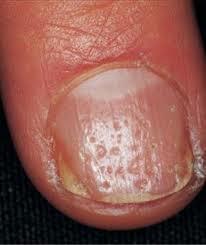 Once this issue is removed, the white spots should stop appearing after the nail has grown out. Nail pitting is typically seen in individuals that either have psoriasis, eczema, or another inflammatory skin disorder. It also can occur when an individual has alopecia, Lupus (SLE), or another connective tissue disorder. If you see pitting and do not currently have any of these conditions, this may be a sign that you are at risk for one of these disorders. Therefore, other areas should be investigated to see if there are any other warning symptoms or signs occurring. Skin disorders often have an origin in increased Pitta (aka heat). Click here to discover ways to reduce the Pitta in your system! 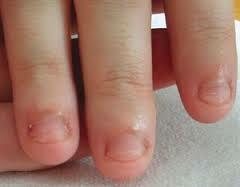 Nail biting is a telling sign of excessive Vata in the system. This is typically a symptom of high anxiety, worry, or fear—all of which are Vata imbalances in the Nervous System. This can be a chronic or acute issue, depending on the individual. Typically, one with a nail-biting habit does it without awareness and rarely has nails that grow beyond the nail bed. Whether an old habit or new, this is a clear sign of high Vata and should be treated accordingly. Click here for simple tips on how to balance Vata! 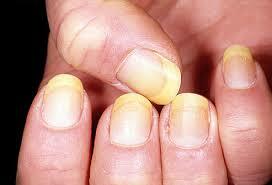 Yellow nails can mean a few different issues and may have a wide array of severeness. One potential issue is a fungal infection. This is more common as you grow older, although any individual can be at risk. 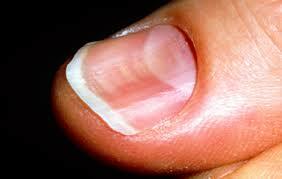 A fungal infection can affect one nail selectively or multiple nails at once. Fungal infections can be due to genetics, lowered immunity, liver issues, toxins in the system, or excessive use of nail polish (or a combination of these). Other common causes of yellow nails include jaundice or other liver issues, tuberculosis, lung infections, or certain side effects from medications. 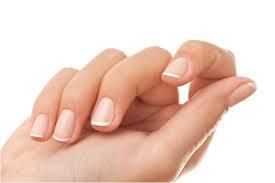 Pale nails typically show anemia (low red blood cells) in the system. This can be due to excessive blood loss (heavy menstruation or injury); an iron, folate or B12 deficiency; ulcer; parasitical infection; certain medications (including NSAIDS); malabsorption; chronic diseases such as cancer, rheumatoid arthritis or HIV; or many different autoimmune conditions. Anemia can cause fatigue, weakness, poor circulation, frequent bruising, shortness of breath, irregular heartbeat, and cognitive issues. If anemia is suspected, one can look to see if other symptoms are involved (or not), as well as examining the tongue and the pink under the eye (when stretched down) to see if these areas are also pale. If you see a bluish-purple tint to your nails, this may signify that there is a lack of oxygen in the system causing hypoxia or acute cyanosis (lack of oxygen to the tissues). This can be caused by a chronic issue or a severe acute issue. There may be a pulmonary infection such as chronic bronchitis or a long-term condition such as asthma or emphysema. A great way to increase your lung energy is with regular practice of Alternate Nostril Breathing (aka Nadi Shodhana). Click here for full instructions on this powerful breathing technique. 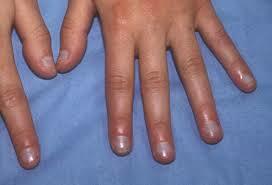 Onycholysis is when the nail begins to separate from the nail bed causing a white discoloration. 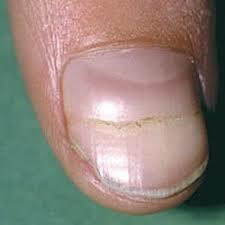 If the white discoloration becomes yellow, it is most likely that the nail has obtained a secondary infection due to the separation. 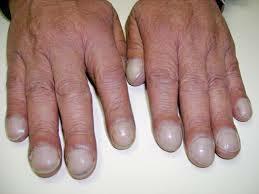 Onycholysis is commonly caused by skin disorders such as psoriasis, eczema, and dermatitis but also can stem from trauma, excessive manicures, hyperthyroidism, hypothyroidism, primary fungal infection, poor circulation, or inflammatory arthritis. Although not as common as some other nail abnormalities, clubbed nails are often prevalent with heart or pulmonary issues. They may occur in tuberculosis, pneumonia, chronic bronchitis, congestive heart failure, or mitral stenosis. No matter the cause, clubbing of the fingers typically is a sign that the peripheral tissues are not getting a sufficient amount of oxygen and there is low Prana (aka life-force) in the body. Click here to discover simple ways to increase the Prana in your system! A “spooned” nail is a nail that is flat or concave at the surface, scooping in the center. This can range in severity, with the worst cases causing a splitting of the nail down the middle. 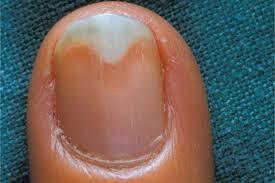 The most common cause for the spooned nail is iron deficiency anemia (also see “pale nails” above). Other potential causes are autoimmune issues such as Lupus (SLE), psoriasis, lichen planus or Raynaud’s Disease, genetic disorders, vascular disease, or trauma. Once again, a you’ve written a fantastic article. As a person with Psoriasis and psoriatic arthritis, my nails can attest the truth in the pictures. Thank you for sharing your knowledge, so many of us can learn too. Very interesting, i’d like to learn more. 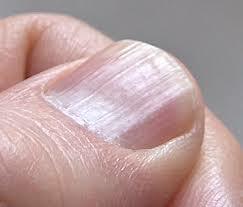 Where can I find a practitioner near me who diagnosis fingernail health and treatment? Thank you for this great question! 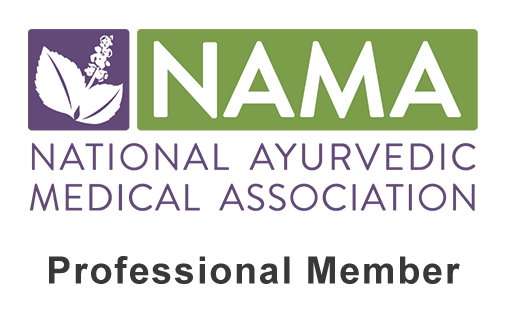 A great resource for finding practitioners in your area is through the NAMA (National Ayurvedic Medicine Association) website. 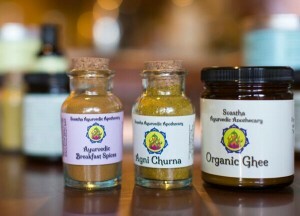 Here is a direct link: https://ayurvedanama.site-ym.com/search/custom.asp?id=945. Seeing the practitioner in person is always preferred when available, as they can not only perform the nail analysis but also the tongue, facial, and pulse diagnosis. Please let me know if you have any further questions!